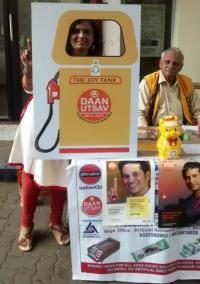 IOC, as their celebration of DaanUtsav, gave free space on all their petrol pumps, for NGOs. The NGOs did collection of material and cash donations also. This happened across 60 petrol pumps in Mumbai, Navi Mumbai and Thane.